Choosing fabrics is more enjoyable than before. 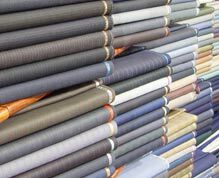 Many choices, in various designs and blends of both local and imported fabrics, eithfer for suits, trousers or jackets coast are all presented in Petomen with a variety of hues and colors..
You may find all kind of fabrics which you may request, in Terrzi’s store. The most important aim of Terrzi is arranging softest, highest quality and famous brands by storing all manner of garments. Thus, any troubles which appears during strolling shops are avoided.